Trampolines are the latest craze among children in the UK the musthave toy for the summer. They have the bonus of being of form of healthy exercise as well as being great fun. Widely available from DIY stores and garden centres, they are reportedly the third most wanted gift for children aged five to 13. But as they literally spring up in gardens around the country, parents under pressure from their children to acquire one should stop and think before they rush off to the shops. Not all gardens will be suitable for a trampoline, and its always best to consider the safety implications before making an expensive purchase. The current boom in trampolining is almost certain to lead to an increase in accidents, but that does not mean that parents should not buy trampolines for their children. Play often leads to children being hurt it is part of growing up. There are bound to be the odd bumps and bruises. Trampolining can be enjoyed safely if a few simple guidelines are followed. The latest accident figures available are for 2002 and these showed 11,500 people in the UK going to hospital after an accident with a trampoline an increase of more than 50 per cent over a fiveyear period. Accidents on trampolines at home had increased almost fourfold in the same time, with 4,200 under15s being hurt in 2002. The growing popularity of the sport also saw injuries rise to 6,700 in places such as sports halls and gymnasia, but at nowhere near the same rate as those at home. Approximately 75% of injuries occur when more than one person is on the trampoline. The person weighing less is five times more likely to be injured.Children under six years old are particularly vulnerable to injury.Injuries can occur to all parts of the body, including the neck, arms, legs face and head. Head and neck injuries are the most serious injuries associated with trampolines.Adult supervision is no guarantee of safety. More than half of all trampoline accidents occur whilst under supervision. However a trained spotter can greatly reduce this risk. 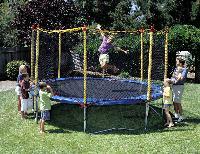 Consider models that have safety netting as part of the design, or purchase a safety cage when you buy the trampoline. This will reduce the chance of your child falling of the trampoline and striking the ground. All commercial trampolines manufactured from 2001 should meet BS EN 132192001 Trampolines, however there is no similar standard for domestic, home and garden trampolines. Choose a clear area, which is clear from hazards such as trees, fences, washing lines, poles or other equipment. Ideally there should be a safe fall zone completely around the trampoline of at least 2.5 metres. This should also include bikes, skateboards and other toys that could be a hazard. Never use a ladder with the trampoline because it provides unsupervised access to small children. 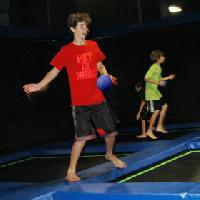 Tie down large trampolines there are tether kits available that can be used for this purpose. Flip upside down smaller rectangular trampolines. Remove safety netting from enclosurecage frames to reduce the saillike qualities of the cages during windy weather. Never allow more than one person on the trampoline at the same time. No somersaults go to a properly organised club if you want to try more complicated moves. No somersaults! Dont try risky stunts like somersaults and flips. Always bounce in the middle of the trampoline. Stand back! Keep away from the trampoline when someone else is jumping. Out of bounds! Dont use the trampoline if you see a rip or split in the mat, or if the padding has come away from the metal springs. Tell an adult. In order to participate in the league, each participant must sign the team waiver. Waivers are provided and must be completed and handed in no later than the first night of play. Players not present the first week of play will still be required to sign a waiver with our staff before participating.